PERVOMAYSK, Ukraine -- “Are they waiting for us?” asked Olga Ischenko, the mayor of Pervomaysk, a rebel-held town on the frontlines of the conflict in eastern Ukraine. Missile casings and unexploded shells in front of a statue of Lenin, Pervomaysk, Ukraine, March 20, 2015. She was asking me because I had just been in Popasnaya, a government-held town five miles away. She wanted to know if its people were yearning to be liberated by the rebels. What has happened to these neighboring towns shows just how divided and bitter the region has become since fighting began almost exactly a year ago. Before the war Pervomaysk’s population was nearly 39,000, while Popasnaya’s was 22,000; the former is a mining town, the latter mostly industrial and agricultural. Identities in this part of Ukraine are fluid and Russian is the lingua franca, but according to the 2001 census a majority of people in the Popasnaya district regarded Ukrainian as their first language, while in Pervomaysk it was Russian. The war has shattered the economies of both and most of their populations have fled, either just away from the front, to Russia, or to other parts of Ukraine. It also has left them on opposite sides. 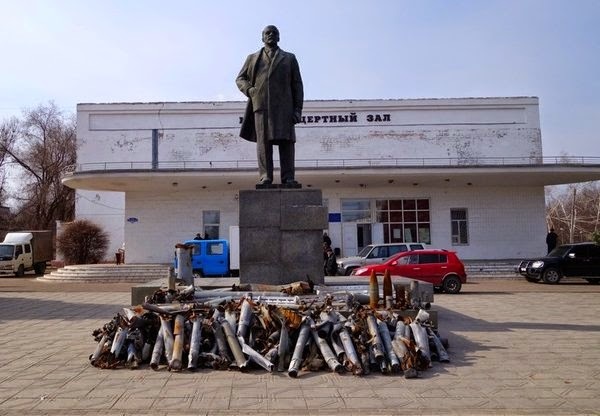 Just outside the Pervomaysk town hall where Mayor Ischenko works is a statue of Lenin, in front of which have been stacked unexploded artillery shells and the remains of Grad and Smerch missiles fired at her town from Popasnaya. Until January 22, the mayor was Evgeny Ischenko, Olga’s husband, a Cossack militia leader whose forces are part of those of the self-proclaimed Luhansk People’s Republic. Then he was murdered, so she took over. Olga Ischenko is thirty-seven years old, and has two children, one aged nine and another nine months old. She said “nobody knows for sure” who killed her husband and she was vague about who might have looted the town unless she had taken power. When her husband died, Igor Plotnitsky, the leader of the Lugansk People’s Republic, blamed the Ukrainians, but it is widely believed that the murder was an inside job. A few weeks before he was killed, Evgeny Ischenko attacked Plotnitsky for signing a September 5 ceasefire agreement with the Ukrainians, which was not holding. Now that things are calmer, following the signing of a second ceasefire agreement in Minsk in mid-February, it is easier to travel around eastern Ukraine. In Pervomaysk, whose population, according to Olga Ischenko, dwindled to 8,000 during the worst of the fighting, people have started to come back. But no one believes that it is anything more than a lull in the conflict. The rebels could not survive without Russian military support; but with it, the Ukrainians cannot defeat them. Meanwhile, leaders on both sides are talking about eventual victory rather than a negotiated peace. “We are going to take our land back,” said Ischenko, by which she means, at the very least, the whole of Luhansk “oblast” or province, including neighboring Popasnaya. Then, she said, the Luhansk People’s Republic should become a republic within Russia. In a nearby housing complex, I saw a block that was completely burned out. Some apartments had gaping holes where they had taken direct hits. Most windows were gone and either boarded up or patched with plastic sheeting. On another block, the corner of a whole building had come down. There were few people on the streets, even though it was quiet, spring had begun, and the sun was being eclipsed by the moon. A woman dressed all in black walked by with her glossy black Labrador, trailed by four friendly strays who had joined them for their walk. Natalya Sokolik is a forty-one-year-old doctor. She described three waves of fighting, the last one of which ended with the current ceasefire. She reckoned that out of two hundred local doctors only twenty-five are left. In her block, which was home to some 250 people, she thinks there may be thirty or forty now, though some have trickled back recently. There are virtually no jobs in Pervomaysk, and while there was food in the few shops still open, basics are expensive and money is a huge issue. The rebel-held east has been cut off from Ukraine’s financial and banking system, so it is hard to get cash. A large proportion of those who have stayed are pensioners but it is harder and harder for them to get their pensions. Officially you have to travel to government-controlled regions and register as a refugee, but that is beyond the means of many. It can take up to two months just to get the permission necessary to travel to government territory and back. About the future, Sokolik was circumspect. No one knows what will happen in the next few months and I am being shown around by a man in uniform. On this side of the line the other side is increasingly referred to as “Ukraine,” as though it has already become the foreign country that rebel leaders want it to be. A few minutes later I met a group of old ladies chatting in the sun. They showed me the cellar under their block where they lived when there was shelling; they talked about two of their cohort who had been killed when running for a nearby shelter. The ladies had planted some onions they had received as part of a package of humanitarian aid and nearby, spring bulbs were peeking into life in their courtyard. A short drive away is a nuclear bunker from the 1960s—complete with pictures of mushroom clouds and instructions about what to do in case of a nuclear attack—where forty-two people are sleeping. When the fighting was bad up to two hundred had crammed in. Now some didn’t want to leave because they were still scared or because their homes were uninhabitable. Alona Petrova, sixteen, sat on her bed with her boyfriend Rovshan Gladkikh, who is twenty. They met in the bunker and theirs is a wartime romance. When the war is over, Alona wants to study and Rovshan wants to become a miner like his father. A few miles away is the town of Stakhanov, named after the champion miner of Soviet legend who worked in a nearby coal mine. Rovshan said that his mother, who survived a shelling incident, was too scared to go home. His eleven-year-old sister Sabrina was watching TV. “We want independence,” he said. On the government-held side of the front lines, the situation is only slightly better. When our guide, nom de guerre Gnome, drove us in his armored car to Popasnaya—which the rebels held and then lost in summer—he insisted we put on our flak jackets for the final stretch. Then he stepped hard on the accelerator and we hurtled down the last few miles of straight and exposed road. As we did so he kept glancing to his right, over the fields. A few days before, he said, his tire had been shot out by a rebel sniper. Gnome is a doctor and member of Hospitallers, a volunteer group who draw their name and inspiration from the Knights Hospittaler orders founded during the Crusades. They are doctors and medics who have established a system for frontline medical evacuations to address the problem of Ukrainian soldiers dying because they could not get proper treatment quickly enough. At the moment, Popasnaya is as quiet as Pervomaysk. In its hospital I met Dr. Alexander Kavalchuk, who used to work there. Now he is head of the surgical unit in Popasnaya. From Popasnaya’s estimated 2011 population of 22,000 people he said there might now be just 5,000. Nonetheless, he said, about 70 percent of the hospital medical staff has either remained or returned. Unlike in Pervomaysk, staff are being paid and the banking system is working. According to Kavalchuk, many of those who remain in Pervomaysk had voted for the “Russian World” (an expression favored by Russian nationalists) in the rebel anti-Ukrainian referendums of last May. But now that they have “tasted it,” he says, many regret it. But in Popasnaya, he concedes, there are people, especially “simple people”—as opposed to middle class ones—who support the rebels. In a ward I met Alexander, aged fifty-two. He said he has not left Popasnaya because he must look after his parents, who are too old to go. His apartment has been damaged and he can’t live in it. “I don’t know who shelled it,” he said, “but it obviously came from Pervomaysk. We are fed up with everyone and everything. A man in the next bed who does not want to tell me his name said that “Ukraine wants peace,” but that he thought its leaders do not. The center of Popasnaya has been damaged, though not as extensively as Pervomaysk. Bundles of clothes lie on the rubble of a block whose top corner apartment has been eviscerated by a missile. One person was killed in the attack. A fifty-year-old man named Oleg said he was collecting things from his apartment for his ex-wife and son, who have moved to Kharkiv, Ukraine’s second largest city, located in the northeast of the country. He was stuffing it all in his car. In a grocery shop a woman named Oxana, aged forty-one, told me that her twenty-one-year-old son had gone to Russia. Half of her friends have gone to Russia. “I supported this country from the beginning,” she says, but many did not. On the way out of town there is a big Ukrainian checkpoint. The rebel lines are a mile away. In Pervomaysk they say that the Ukrainians have been firing at them from here. The checkpoint is close to an area of low-rise apartment blocks, just like the ones in Pervomaysk. Many are damaged and many roofs have been holed by shelling. I asked a middle-aged woman I found there if anyone else still lives in these hundreds of apartments. She lived in the basement for two weeks when shelling was bad. The electricity and gas were off, but now they have been restored, though running water has not. Civilians are suffering, as they do in all wars, but in this one, older people are suffering the most. Even when peace returns to Pervomaysk, it will have to contend with a fresh layer of bitterness. It was already a dilapidated, rust-belt sort of place before the conflict began and it is hard to imagine it flourishing again. As in war-ravaged parts of the Balkans, buildings can be rebuilt, but if there is no work and no reason to return, then places like this will dwindle and die.